So it is time for March madness. The thing is, I use to love basketball, but I am just not that into it anymore. I think a big part of it is that I just don’t keep up with it. This is why I’m not writing about basketball. Instead I want to deal with something that was brought up in the comments of yesterday’s post. Sherry Meneley mentioned that she watched a young lady get baptized that she felt was not ready. As I understand it the young lady behaved in a rather un-repentant manner. I might be understating this because Sherry said she felt that the girl would come up from the water changed into a glowing angel or that she would be a head spinning, projectile vomiting demon. Sherry is not a judgmental type of person, in fact she is really open to the grace of God so I tend to think this girl had issues. She asked what my position is on baptism and if I would refuse to baptize someone. I think I would, but not necessarily for this reason. Please let me elaborate by explaining what I believe baptism to be. Baptism is a symbol but it is also more than that. It is a symbol of our initiation into our Christian walk. It is a symbol of dying to our old self and being raised into a new life with Christ. It is a symbol of our confession of faith. It is also an act of obedience, we are commanded to baptize and also expected to be baptized. Baptism goes deeper still I don’t know exactly how, but in being obedient I believe we some how participate in a small way with Christ. I think that is something that we, as Protestants, have missed is the fact that we are participating with Christ through the rites of the Church, like baptism and communion. I wouldn’t baptize someone that didn’t understand this and agree to the ideas contained in it. 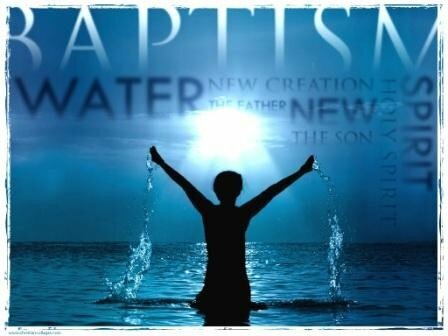 If baptism is a public profession of personal faith then how could I baptize one of my students that don’t really believe in Christ as their Lord and Savior? More over how could I baptize a child that can’t really grasp this? A while back I had a parent bring two children for baptism, one was a bit older and able to understand and confess, but the other couldn’t. I didn’t refuse but I asked the parents to be there while we talked about what baptism was all about in a class setting. After the parents asked to have the older girl baptized but wanted to wait till the younger girl could grasp these concepts. To the question of this young lady. From what I know of Sherry I tend to think I would have insisted on talking to this girl and making sure she did have a relationship with God through Christ. It may well be that she recently gave her heart to God and I would welcome her to participate in baptism as a first step in her journey. If she claimed to be a Christian but refused to submit to Christ instead holding steadfastly to slavery in sin, then I feel I would want to talk on the subject further making sure she understood what baptism is about and what she is saying regarding her old life. If she wanted to stand up and say that she was renouncing a life of sin and was willing to be encouraged in that then I would be willing to baptize her. If she refused any of that but wanted to get baptized just because everyone else was and didn’t really want a part in Christ or his righteousness then I wouldn’t feel any obligation, compunction, or desire to let her participate in something that is holy. Oh. Glad I re-read your post title. AT first, I thought it said “drunk” or pass. Thanks for the great post Nick! I definitely feel a new post stirring in me from all this talk about dunking. Nick, I’m really glad you talk with the kids. I know it probably deters some of the kids…because it’s hard to talk about faith when you’re so young – but it’s also important. I hate to think kids are getting dunked “just because” and “all my friends are doing it” (yet I know it’s true, even I did it that way at a summer camp). I hate that Christians might take the stance of “beggars can’t be choosers” when it comes to tallying up the numbers for salvation and baptism, yet I know that’s true too. Take it from a guy who’s been baptized two times. I went forward at the age of 9, only because my mom told me to go forward. I had no idea or understood the whole “Christianity” thing, but the pastor just baptized me with no questions. Question, do you think it’s necessary to understand the whole gospel message if all you understand the time is, “I believe in Jesus Christ.”? Because if that’s the case, there’s a whole lot of people who got baptized too early.